I was having trouble thinking about a craft project to blog about today. Years ago, when my son was in elementary school, I taught a class in hand sewing and embroidery in the after-school program the parents’ group sponsored. All the little girls in my first class have now graduated from college. It is hard to believe that the doll I made as a sample is that old. The doll was made using Winky Cherry’s book “My first Doll Book” published by Palmer and Pletsch. All the “My First Sewing Books” are easy to adapt to a large class of little girls. It was a lot of fun designing the clothes for each doll according to what each girl wanted. 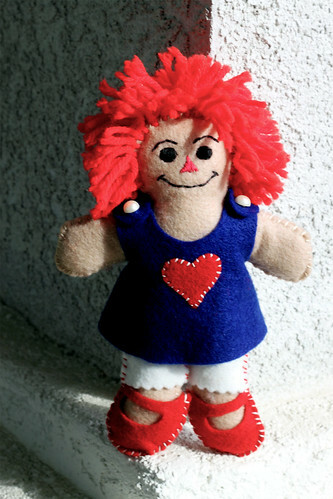 I made the sample doll look like Raggedy Ann because I didn’t want to use any yarn in a more natural hair color. That way the girls would have plenty of hair for their dolls. This entry was posted on Monday, October 5th, 2009 at 3:00 am and is filed under Craft and Sewing. Tagged: Craft, Sewing. You can feed this entry. You can leave a response, or trackback from your own site. She’s cute! My niece who is turning 7 would love to make something like that!